All the best wizards have beards. In fact, we think it’s somewhere in the rules of being a wizard that you have to grow some pretty substantial facial hair. If you want to even think about casting magical fireballs and spells of polymorphing, then you'd better grow one. Unfortunately, that takes some time. If you want that Merlin kind of look, it could take you months, even years. But it doesn’t have to be that way. What if we told you that there was a way to get some rockin’ white chin whiskers? 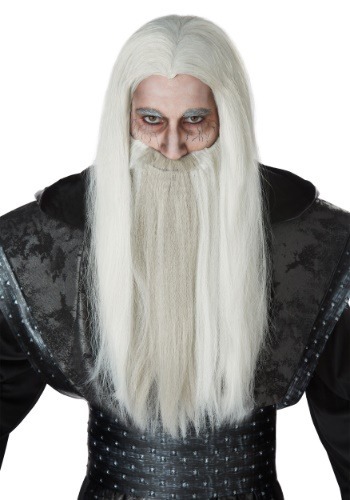 This intimidating dark wizard wig and beard set gives you a sorcerous look that should have you ready to learn the arcane secrets of the dark arts. Both of them are a silver color, giving you a style that makes you look capable of casting a magic missile at your foes. You won’t even need to roll a 20 to critical.